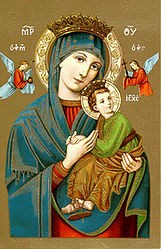 This icon received the title “Our Lady of Perpetual Help,” in Western Europe. The pose was first painted in the Balkan countries in the fourteenth century. The Christ Child has run to His mother and jumped into her arms after seeing two angels holding the instruments of His future passion. In His haste, one sandal has come off. The Christ Child continues to look, in fear and astonishment, at the angel holding the cross. Mary looks at us and entreats us to consider God’s love for the world. In Byzantine theology Christ’s passion and death are not seen as a debt paid to a wrathful Father. Jesus Christ, as person, is God’s answer to the human condition. Christ embraced all of human suffering and oppression in solidarity with us. “Hades seized a body, and lo! It discovered God; seized earth, and behold! It encountered heaven; it seized the visible, and was overcome by the invisible. O death, where is your sting? O Hades, where is your victory? Christ is Risen and you are abolished…Christ is risen and life is freed…”(St. John Chrysostom). Because Christ was both God and human, death was destroyed when it swallowed Him. The Cross, Bible and Dove symbolize our Catholic faith and the mountains and the rivers represent the Kamloops area. Our school crest was designed by Annamaria Bittante a former student of Our Lady of Perpetual Help School. Partners (home, school and parish) in Catholic Education must work together to provide an environment where faith and learning go hand in hand leaning the young people to be the best they can be. The first day of school, September 1962, was a memorable occasion for thirty-five Grade One students and twenty-nine Grade Two students, their parents and parishioners. O.L.P.H. School was opened and the dream, begun in 1959, became a reality. Parishioners under the leadership of Bishop Michael Harrington had canvassed for the necessary funds and spent countless hours constructing the school. The school consisted of eight classrooms on the main floor and a basement which would serve as a gym/auditorium and more classrooms as the need arose. The Sisters of Saint Martha, Antigonish, Nova Scotia, were invited to administer the school and to provide teaching sisters. Sister Ann Carmel (Claire MacNeil) taught Grade One and Sister Ian Marie (Margaret MacFarlane) taught Grade Two as well as being Principal. In 1967 students were enrolled in Grade Seven and in 1977 the first Kindergarten class was enrolled. As the enrollment increased and the grades were added it was necessary to put on an addition. This addition was completed in 1967 and consisted of four rooms, two on the upper level and two in the basement. One of these served as a library, with Sister Mary Reginald, CSM as the first Librarian. With the closing of the Residential School in 1968 many of its students also enrolled in O.L.P.H. Like all Catholic Schools O.L.P.H. shares in the mission of the Church to proclaim the GOOD NEWS and foster Catholic Education. We, the present members of the School Council, wish to express our gratitude to all who support us and make our mission possible, the staff, parents and all interested parishioners.